JUNE 2017: Our Intactivists of the Month for June are Sarah & Bill Cooney. Sarah and Bill are lawyers and live on Long Island, outside New York City. Bill is an associate at a Manhattan law firm. Sarah, who grew up in the suburbs of London, is a stay-at-home mom to their two boys, Timothy, 8, and Marty, 5. Before she met Bill and had children, Sarah never would have described herself as an activist. "I drifted through life being quite neutral on many things," she says. "Then I fell in love with a guy who was circumcised and I had sons, and suddenly I had to defend my sons in this modern country. "I’m British. Foreskin is just another body part for most Brits and Europeans and we simply accept it. I never thought about it." Like most of his male peers born in the United States, Bill was circumcised shortly after birth. Sarah was shocked the practice was a routine medical procedure in the U.S.
As Sarah explored the situation further and shared her findings with Bill, he became equally outraged. The birth of their first son was a defining moment for both of them. During pregnancy they had told doctors that if their child was a boy, they did not want him to be circumcised. After the delivery, an emergency C-section, Bill reminded everyone in the room—doctors and nurses—that their son was not to be circumcised. The next day, he walked to the nurses’ station and asked when Sarah and the baby could be discharged. The nurse looked at her terminal and said Timothy was scheduled to be circumcised the following day. In the end, neither of their sons was circumcised. But the Cooneys are astounded and heartbroken that millions of American boys are not so fortunate. “If a product or an item kills or harms one child, it’s removed from the market. This procedure has killed more than one child, and it’s still pushed,” Sarah says. In an effort borne out of his Catholic roots, Bill is working with other Catholic intactivists to press the Church to recognize circumcision as a misapplication of church doctrine, which considers amputations that are not strictly therapeutic to be against moral law. In letters, Bill has urged leading U.S. Catholic cardinals and bishops to stop Catholic hospitals from allowing routine infant circumcision. One of the bishops consulted with a moral theologian who conceded there is a moral obligation to explore the matter further. Some of the most meaningful exchanges occur in one-on-one conversations. Bill speaks privately with expecting friends, gently urging them to consider their options. Many such conversations happen at protests and rallies, from Intaction events at Union Square in Manhattan to medical conferences in Washington, D.C. 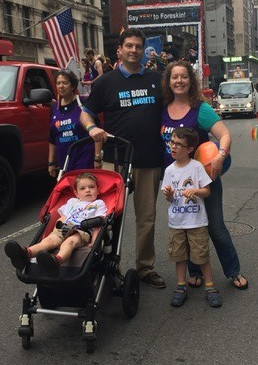 The Cooneys have marched alongside Intact America’s float, with their children and in the New York City Pride parade since 2015. Sarah also educates at baby fairs and local festivals. She organized a protest outside a showing of “Bad Moms” at her town’s movie theater to protest the film’s body-shaming of natural male genitalia. During one protest at a medical conference, Bill stood apart from other intactivists and, dressed in a suit, handed out spoof flyers for doctors interested in earning continuing medical education credits. The flyers described the ethical and medical implications of circumcision. Compared to intactivists who have been on the front lines for decades, the Cooneys are relatively new to the fight. They are learning to step through the minefields of discord that come with taking a stand. How to educate and share without alienating close friends and family is a delicate dance, they say. Rewarding moments come during protests and rallies. 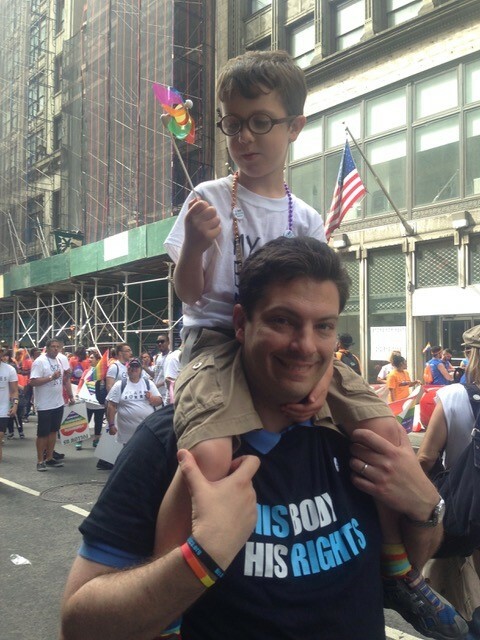 “A Jewish man came up with his 14-year-old son,” Sarah says. “He was the only one in the family who didn’t have his son circumcised. He didn’t think it was right. He had come to that conclusion on his own and he thought he was the only one in the world who thought that way.